VTT Technical Research Centre of Finland is an impartial multidisciplinary expert organisation which creates new, globally competitive technologies and innovations by combining knowledge and expertise in different fields. VTT produces research, development, testing and information services to public sector and companies as well as international organisations. VTT’s turnover is 217 Million € and it employs 2700 experts. In the area of services, VTT carries out versatile research which goes from industrial applications, innovation management, and business models and business operations to user-driven service development, networks and systems engineering for services, and finally to their evaluation and assessment. VTT’s cross-disciplinary Service Science and Business (SSB) network links VTT’s researchers and managers active in the field of services (currently about 80 persons). Marja Toivonen, Research Professor, Dr.
Minna Isomursu, Research Professor, Dr.
Maaria Nuutinen, Researcher, Team Leader, Dr. The project researches and develops new ways of working and collaborating in daily work that enable both productivity and renewal. It is parallel with the SME companies’ own development projects. The object of research is the interaction situations between companies and the interpre-tation of the situated understanding as organisational learning and cultural change drivers. The context of the study is new business development related to services and solutions within our collaboration companies. The results of the study are conceptual models and principles of work-ing, organising, developing and leading a future good workplace in an agile company. These models can be also utilised in development of new technological solutions for agile organisa-tions. The results will be summarised into a book (in Finnish) aimed for managers and develop-ers, as well as scientific articles. Renewing roles in service co-production and development has attracted increasing attention among researchers and practitioners. However, typically studies of service innovation and new service development (NSD) have focused on the provider–customer dyad and less on co-development in a multi-agent environment. Also, in-depth studies of knowledge-intensive busi-ness services (KIBS) companies’ facilitation practices in multi-agent environments are still rare. In CoSVac-project we are aiming to narrow these research gaps by taking the entire value chain, or value network, and the external facilitation into consideration. Special focus has been placed on the learning mechanisms in user-driven co-innovation processes. In addition to managerial implications, four case-studies from different industries have already resulted in scientific arti-cles. Also collaboration with the University of Naples has been created in terms of planning an international book about the studied themes. DIGILE is an ecosystem effort to pool service enablers and platforms to innovate, launch and horizontalize new services. Work is organized into four work packages: SME services (coordi-nated by VTT), financial services (coordinated by VTT), education and wellbeing. The project has successfully built new service ecosystems which have developed and validated novel digital service concepts, for example, for omnichannel retail, digital customer loyalty program man-agement and mixed reality learning. The project is coordinated by Nokia, and it is co-funded by participating organizations and TEKES. The project aims to tackle the problems of slowness, rigidity and insufficient effectiveness of current innovation processes. The basic argument behind the search for alternative innovation models is that a highly formalized process with a fixed goal is not the way we can ‘tackle the unknown’. We argue that the effectuation approach not only makes innovation more rapid, but also results in more radical innovations. We emphasize the creation of new theoretical under-standing in our project. However, we also pursue findings that are applicable in the short term and foster the renewal of industries. In order to enable the achievement of these different goals, we bring together perspectives that until now have developed apart from each other. Two types of ‘bridging’ are particularly central: 1) enriching innovation theories with the service-dominant logic approach (SDL), and 2) utilizing the system dynamic modelling as a way to concretize the ideas of SDL in the innovation context. The broad actor-to-actor perspective included in SDL enables the building of innovation models that are applicable in both manufacturing and service sectors, in both B-to-B and B-to-C contexts, and in both private and public organizations. The project focuses on branding service concepts in China and Far East. A successful service brand is based on careful analysis of customers’ needs. It creates competitive advantage and helps to define the right price level. The branding model of products cannot be transferred di-rectly to services, but the specificities of services have to be taken into account. Also, branding services in Asia is different from Europe due to their specific business cultures. The project compares success factors in service business between China and other countries in Far East, and helps companies to understand the Asian market better. The aim is to tackle real-life problems, learn and seek solutions together with companies. The results are to be presented in a form which can be utilized concretely. The focus of SHINE – Service Network Integrator project is on service integrator’s network models and service network collaboration. The project examines the value creation from the ser-vice integrator’s viewpoint; how services are developed and produced in service networks and what kind of network management and collaboration models facilitate value creation. The project creates new knowledge on service network management in different industries. SOPPI project is a FiDiPro project that studies service innovations hand in hand with social and system innovations. The projectaims at fostering service, social and system innovations through an improved understanding of their nature, developing methods and tools for the examination and management of service, social and system innovations and for the evaluation of their im-pacts, and building up Finnish policy competences in harnessing the benefits of service, social and system innovations. The project is carried out in collaboration between VTT and SC-Research (University of Vaasa) in 2012-2014. 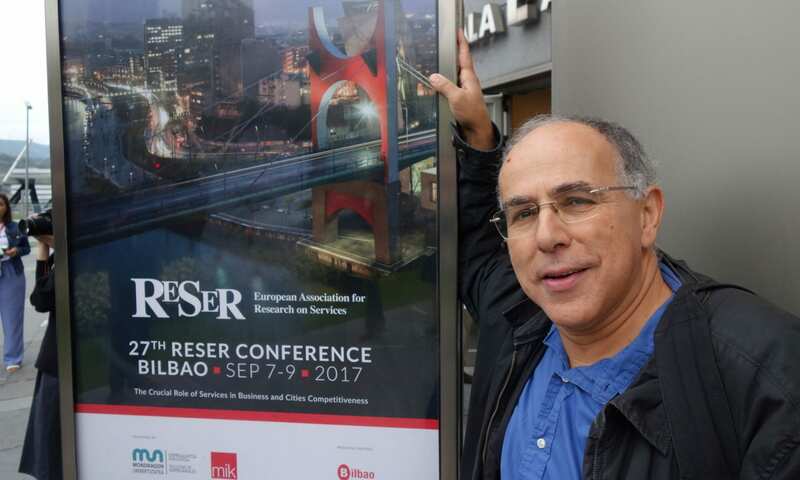 The invited FidiPro Professor is Luis Rubalcaba from the University of Alcalá, Madrid. The purpose of this project is to describe, analyze and evaluate how value is co-created in busi-ness services through modularity and collaborative business networks. The project studies the customer’s role as well as the roles of other network actors in value co-creation and service co-production processes, the resource integration practices (e.g. knowledge and capabilities) be-tween the actors, and the importance of modularity in creating more value to all actors involved. The research has been conducted in collaboration of University of Oulu and VTT. The Inno-Wellness project (Innovation management and wellbeing models in the public sector) studies and develops new innovation management practices, which combine the perspectives of user-based and employee-driven service innovation and promote employee well-being in the public sector. The research process creates a learning network for pondering generalisations and learning across sectors. The research involves seven case studies which represent different pub-lic service organisations in Finland. The project aims to answer critical societal demands, e.g. how employees in the public sector could stay longer in the work life. In innovation research, the project is linked to the views of customer value based innovations and open innovation. Through better innovation management, the improvement of effectiveness, productivity and quality of services is expected. The ongoing municipal service reform towards a multiple supplier model calls for new innova-tive service and operation models and a new management approach. The management of this process requires in particular a process- and player-based development approach that takes cus-tomers, users and personnel groups into consideration, and a systematic scheme for assessing and monitoring the quality and cost-effectiveness of services. This project provides concrete and contextual results for case representatives in intensive residential services for the elderly and in primary health care. Secondly, an integrative evaluation framework is created, along with a par-ticipatory process with methods for benchmarking and facilitating multiple suppliers in well-being services. The project facilitates and examines the development of customer-focused solutions within ser-vice networks. SOUL has provided new empirical insight with regard to customer-focused so-lutions by applying perspectives of value co-creation, service management, key account man-agement, and customer knowledge management in studying integrated solutions co-creation. Both KIBS and industrial services have been investigated in the project. The results of SOUL has been published e.g. in Industrial Marketing Management and the Journal of Service Man-agement. A customer profile tool for analysing business customers was developed in the SOUL project to enhance companies’ solution sales and marketing. EMS is an initiative of the Fraunhofer Institute for Systems and Innovation Research (ISI), and aim to provide reliable, comprehensive and comparable data about the modernisation and im-provement of manufacturing companies and establishments at the European level. VTT, the Finnish partner in the EMS since 2008, is responsible for collecting the survey data in Finland. This cross-country dataset is updated every two years and, besides implementation of new man-ufacturing technologies and new product innovation, has also special attention for the develop-ment of product-related services, the use of innovative organisational and managerial concepts, as well as their impact on various performance indicators such as productivity, quality or flexi-bility of companies. One of the challenges that a company must solve in order to develop into a successful service provider is that the company operations and way of thinking should develop at a corresponding pace throughout the organization. Any of the single development efforts may not result in de-sired change unless the various steps taken – together with customers and other stakeholders – are integrated into the transformation process on a long-term. The proposed project results in new understanding and methods for the transformation process, for creating service culture and related strategic level management issues. Sindi is a collaboration project between VTT, Tampere University of Technology and Innova-tion Ecosystems group at Stanford University’s Media X. The goal of the project is to develop and validate indicators for measuring the process and impact of user driven ICT supported ser-vice innovation. Furthermore, the project aims at supporting visualization and making meaning of the indicators within their contexts, especially in the contexts of education and well-being. The project will concentrate in exploiting the increasingly diverse digital socially constructed databases, and social media tools in indicator measuring, visualizing and meaning making. European WeCare project has as ultimate goal to encourage older people to participate in their social networks in order to prevent isolation and loneliness. Using user involvement and co-design techniques, the project will develop one internet service to be concretely evaluated in Spain, Ireland, Finland and the Netherlands. Next to service development, business models for successful up scaling and recommendations for national policy are also important goals of the project. Halonen, M., Kallio, K. and Saari E. (2010): ‘Towards Co-Creation of Service Research Pro-jects – a Method for Learning in Networks’, International Journal of Quality and Service Sciences, 2 (1), 128-145. Karvonen, I., Salkari, I. and Ollus, M. (2010): ‘Increasing collaboration preparedness and performance through VO inheritance’, International Journal of Services and Operations Management, 6 (3), 293-312. Kettunen, J., Rakshit, K. and Mikkola, M. (2008): ’Service logistics and the evolving competitive landscape: a case study of the Indian IT services industry’, 13th International Symposium on Logistics (ISL 2008). Bangkok, Thailand, 6 – 8 July 2008. Centre for Concur-rent Enterprise. Nottingham, UK. Lappalainen, I. and Kansola, M. (2011): ’A participatory approach to the parallel evalua-tion of public and private well-being services’, OLKC Conference, Hull, Great Britain, April 2011. Korhonen, H. and Kaarela, I. (2010): ‘Understanding Business Customers’ Resistance to Adopt Industrial Service Innovations’, in Huizingh, E., Conn, S., Torkkeli, M. and Bitran, I. (eds. ): Proceedings of the 3rd ISPIM Innovation Symposium, 12-15 December 2010, Quebec City, Canada. Lappeenranta University of Technology Press. Nuutinen M. and Lappalainen I. (submitted): ’A framework for supporting transformation from products to services – An organisational culture point of view’, Quality and Service Science. Nuutinen, M. Savioja, P. and Sonninen, S. (2007): ‘Realising present, acknowledging the past, and envisaging the future: Challenges of developing the complex socio-technical system of VTS’, Applied Ergonomics, 38, 513-524. Saari E. and Kallio K. (forthcoming, 2011): ‘Developmental Impact Evaluation for Facilitating Learning in Innovation Networks’, American Journal of Evaluation. Salkari, I. and Mikkola, M. (2010): ‘A framework for assessing the business impact of innovative industrial services’, Proceedings Towards new challenges for innovative manage-ment practices of ERIMA – European Research on Innovation Management Symposium, Wiesbaden, Germany, 10-12th June 2010. pp. 43-49. Salkari, I. and Ryynänen, T. (2010): ’Getting a grip of customer value creation in developing industrial services’, International Journal of Projectics, 4 (1), 29-37. Smedlund A. and Toivonen M. (2007): ’The role of KIBS in the IC development of regional clusters’, Journal of Intellectual Capital, 8 (1), 159-170. Toivonen M. (2010): ‘Different types of innovation processes in services and their organisational implications’, in Gallouj F. and Djellal F. (eds. ): The Handbook of Innovation and Services, Cheltenham and Northampton: Edward Elgar. Toivonen M. (2008): ‘Industrial innovations in relation to service sectors’, in Jacobson D. and Hirsch-Kreinsen H. (eds. ): Low-Technology: Innovation and Development in the Knowledge Economy, Cheltenham and Northampton: Edward Elgar, pp. 160-174. Toivonen M. (2007): ‘Innovation policy in services – the development of knowledge- intensive business services (KIBS) in Finland’, INNOVATION: Management, Policy and Practice, 9 (3-4), 249-261. Toivonen M. (2004): ‘Foresight in services – possibilities and special challenges’, The Service Industries Journal, 24 (1), 79-98. Toivonen M. (2003): ‘Internationalization of knowledge-intensive business services in a small European country: experiences from Finland’, in Miozzo M. and Miles I. (eds. ): Internationalization, Technology and Services. Cheltenham and Northampton: Edward Elgar, pp. 206-226. Van der Have, R. (2009): ‘Framing Elements of Service Innovation’, in: Saarinen, J and Ril-la, N. (eds. ): Changes in Innovation – Towards an Improved Understanding of Economic Renewal, Basingstoke: Palgrave Macmillan, pp. 213-225. Van der Have, R.P., Saarinen, J., Pesonen, P. and Rilla, N. (2009): ‘Innovation as Objective: The SFINNO Approach’, in: Saarinen, J. and Rilla, N. (eds. ): Changes in Innovation – Towards an Improved Understanding of Economic Renewal, Basingstoke: Palgrave Macmillan, pp. 9-19. Vähä Pentti (ed.) (2009): Scientific activities in service science and business. VTT Technical Research Centre of Finland.